"... the practice of data journalism has been largely left out of the mainstream of journalism education, even as the field’s relatively small core of devotees has honed it into a powerful and dynamic area of practice." In order to help close this gap, we partnered with the research paper's co-author, Cheryl Phillips of Stanford University, to deliver a modularized set of resources for data journalism classes. With these resources, journalism school professors can customize a plan to teach their students how to explore data sets, find important facts, trends and patterns, and create interactive graphics that they can include in the work that they publish to better inform the public about our current environment at both a global and a local level. 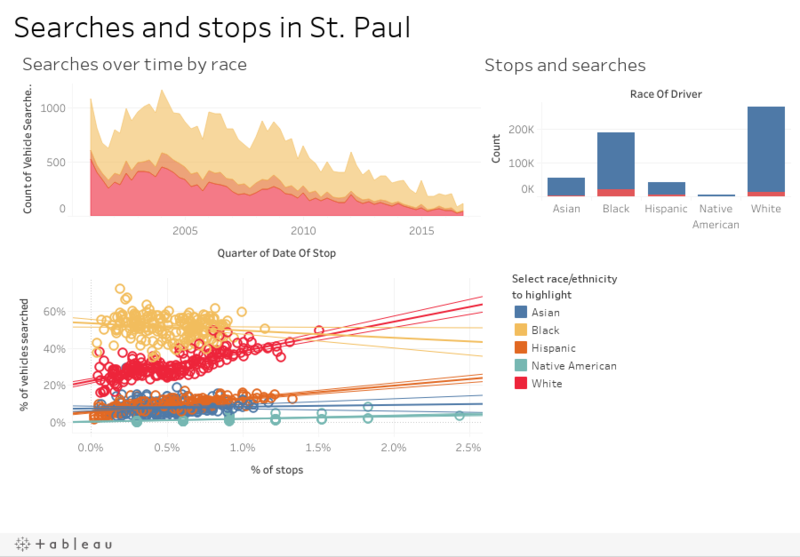 In one example in the curriculum, Phillips shows how to turn a spreadsheet of over 676,000 searches and stop records from the city of St. Paul, Minnesota into an interactive dashboard that can be optimized for mobile, a critical skill for journalists seeking to join newsrooms that are creating content for readers on the go. To request curriculum modules, join the Tableau for Teaching User Group. Please note that this is a private group restricted to instructors, and you must be signed into the Tableau User Community to request access. We also invite you to contribute your own ideas and content through the group discussion board. To see informative and inspirational examples of what journalists in different countries are creating and publishing every day, be sure to check out our Viz of the Day gallery. We’re committed to advancing the use of data in journalism and schools for the long haul. That's why Tableau Public is free, and why we offer a number of ways for those in both fields to obtain a professional license. Are you a journalist? Investigative Reporters and Editors (IRE) get a free license of Tableau Desktop. Members of the Tableau Public team also lead training workshops at journalism conferences and deliver guest lectures in journalism school classrooms all over the world each year. Contact us to learn more. Join us for our webinar, Introduction to Data Journalism, with Cheryl on May 3 to learn more about the new Introduction to Data Journalism course curriculum, including learning objectives and module components.